Go 1 mile and turn left into 164 Ox Creek Road (The mailbox has a large carrot hanging from it during scheduled classes!). Google Maps may mislead you after bout 0.9 mile and direct you to turn on Vance Knob Lane. CONTINUE ON OX CREEK ROAD INSTEAD. 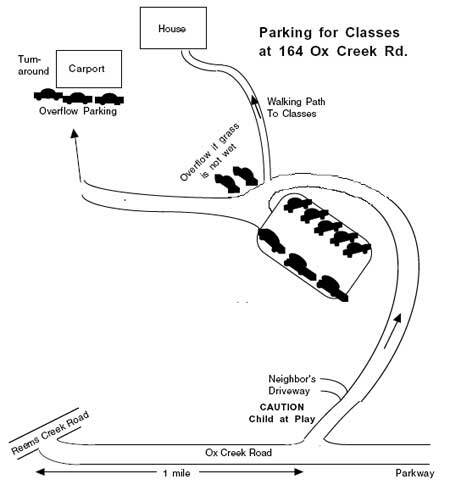 Follow the paved driveway section to the parking area (see parking map below). Exit ramp ends at a traffic signal for Main Street.